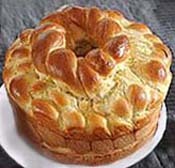 Paska is a very popular, slightly sweet egg bread, consumed throughout Eastern Europe in countries such as Ukraine, Russia, and Poland as part of Easter celebrations. Each country’s recipe differs slightly from the recipes used in other countries, but the symbolism associated with the bread tends to remain the same. Not only is Paska baked throughout Eastern Europe, but those who enjoy it also decorate the top by arranging pieces of dough into designs prior to baking. Detail ranges from braiding, rosettes, and crosses, to more ornate styles. Try out our recipe for Ukranian Paska, and have fun decorating the top however you like! Scald the milk and set aside so that it can cool to a lukewarm temperature. Dissolve 1/2 teaspoon sugar in water and sprinkle yeast over it. Mix and let stand 10 minutes. Add eggs, 1/2 cup sugar, melted butter, salt and 4 1/2 to 5 cups flour to make a dough that is not too stiff nor too slack. Knead until dough no longer sticks to the hand and is smooth and satiny (approximately seven minutes in a mixer, but longer if done by hand). Place in a greased mixing bowl, turn to grease both sides. Cover with greased plastic wrap and let rise until doubled. Punch down and let rise again. Reserve 1/3 of the dough for decorating. Shape the rest into a round loaf and place in a 10- to 12-inch greased round pan. Now shape the reserved dough into decorations of choice (swirls, rosettes, braiding, etc.). Cover the pan with greased plastic wrap and let rise until almost doubled. Heat oven to 400° Fahrenheit. Brush bread with 1 large egg beaten with 2 tablespoons of water. Bake 15 minutes. Reduce temperature to 350° F. and bake an additional 40 minutes or until an instant-read thermometer registers 190° F. If necessary, cover the top of the bread with aluminum foil to prevent the bread from over browning. Remove from oven and turn out onto wire rack to cool completely. This entry was posted on Friday, April 8th, 2011 at 9:17 am and is filed under Mason Cash, Recipes. You can follow any responses to this entry through the RSS 2.0 feed. Both comments and pings are currently closed.